The quote above is the sort that you would expect to be used to motivate troops before a battle or to gee up an athlete at the beginning of long training session. But you might be surprised to hear that it is equally applicable to using NPC’s Well-being Measure! Preparation is vital for getting the most out of the Well-being Measure, particularly if you are using it for the first time. Spending time working out exactly what you want to gain from using the tool reduces the chances of mistakes during the process, and saves time later on. We encourage you to devote as much time as you can to planning your survey. We have designed a six-step process which helps you define the aims of your research, decide what questions to ask, and work out who, where and when to do your survey(s). You can download our guidance here, or it is available on the website. We also have a template that you can fill in to record your plans. Planning really is the first step of any good evaluation so don’t be tempted to launch straight into your survey. 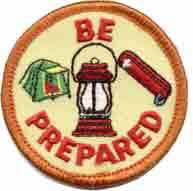 Heed the wise words from Robert Baden Powell, founder of the Scout movement, and ‘be prepared’.